SEOUL, Apr. 19, 2011 –- LG Electronics (LG) today launched to market the first of its appliances embracing the very latest in smart technologies. Starting with smart refrigerators, LG this year will roll out a full spectrum of smart appliances that will transform living through innovative ways to save energy and improve convenience. Not just individual intelligent products, LG’s smart appliances are comprehensive, fully integrated smart solutions for the home. Consumers got their first chance to see LG’s smart technology – called THINQ™ – earlier this year at the Consumer Electronics Show (CES) in Las Vegas. Comprised of Smart Grid, Smart Diagnosis, Smart Access, Smart Adapt and Smart Manager, LG Home Appliances’ smart technology lets users manage their refrigerators, washing machines, ovens and robotic vacuum cleaners via a remote network. In combination with the Smart Grid and LG’s signature core technologies, the new innovations show how LG can deliver big savings in energy, time and expense, greatly enriching consumers’ lives. 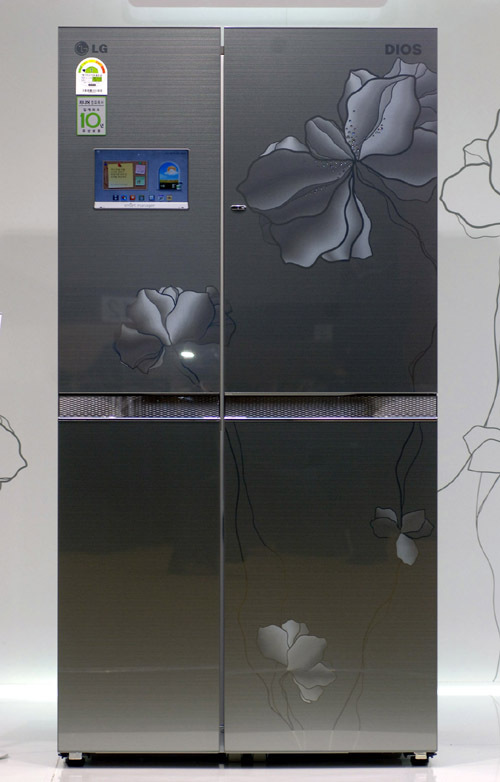 The new smart refrigerator offers updates and information that can be accessed via smartphones and tablets. It offers three poweful smart savings options: late night saving, preferable time saving and the Smart Grid-ready. Late night saving and preferable time saving are currently available in the flat price system and both are extremely effective in saving energy. The Smart Grid-ready option, first demonstrated at this year’s CES, is a smarter function that allows for the savings of even more energy once local utility companies begin offering time-of-use pricing systems. 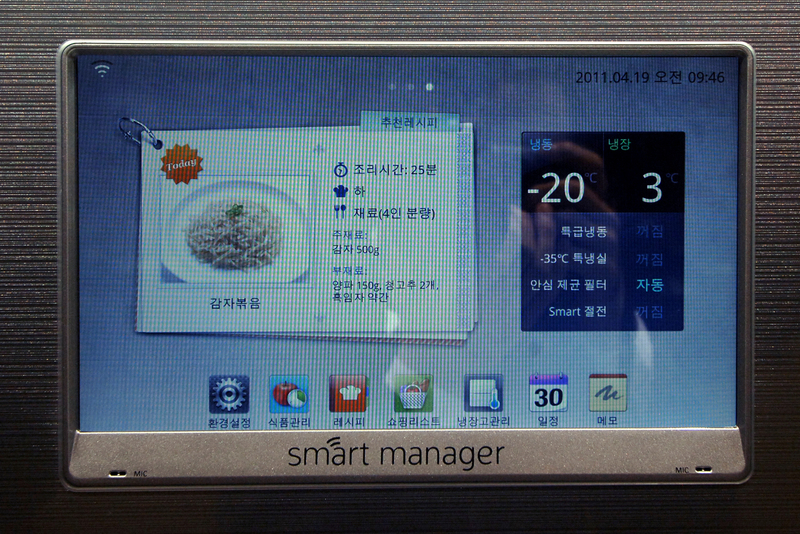 Smart Manager, LG’s food management system, informs users what is in their fridge, where it is and when it expires. This information is accessible via smartphones or tablets through Smart Access so users can have it at their fingertips when they are out grocery shopping or dining at a restaurant planning how to emulate the chef’s gourmet dishes at home. The fridge can even recommend healthy recipes based on what foods are currently available. In addition, thanks to LG’s one-of-a-kind Smart Diagnosis function, LG’s smart fridge provides call center staff with all the information they need to identify any problem over the phone. Smart Diagnosis does away with the need for costly and time-consuming home call-outs by letting LG’s call center know if a problem can be corrected remotely. The smart fridge also comes with Smart Adapt, which allows owners to keep their refrigerator software up-to-date with the latest upgrades, features and options. The smart fridge is also a source of useful information as it keeps track of daily schedules and dispenses regular weather reports. And instead of having to jot notes on sticky memos, family members can turn the fridge’s LCD screen into a note pad to leave messages for each another. As well as delivering optimal washing performance with minimal energy use, LG’s smart washing machine also comes with Smart Diagnosis. So should a problem arise, all owners need to do is dial the call center and push the diagnosis button on the machine and the service center staff will be able to identify what the problem might be by listening to the tones from the washing machine. And thanks to Smart Access, users can monitor and control the LG smart washing machine on their mobile devices. Using a smartphone or tablet, customers can adjust the washer’s cycle or start the drying function remotely, making laundry as easy as making a phone call. LG’s smart refrigerators will be available in Korea starting this month and will be rolled out in other countries in the second half of 2011. Additional smart appliances with THINQ™ Technology will be introduced to markets over the course of the year.